Metasploit is the best and most widely used tool for penetration testing, providing powerful attack simulations, security assessment management, and more. Metasploit is used by White Hat, and by Black Hat, hackers. Metasploit is a playground for hackers where they demonstrate their skill by protecting or damaging the target. In this course, you'll learn how to use Metasploit to enumerate services, identify potential weaknesses, test vulnerabilities through exploitation, and gather evidence for reporting. 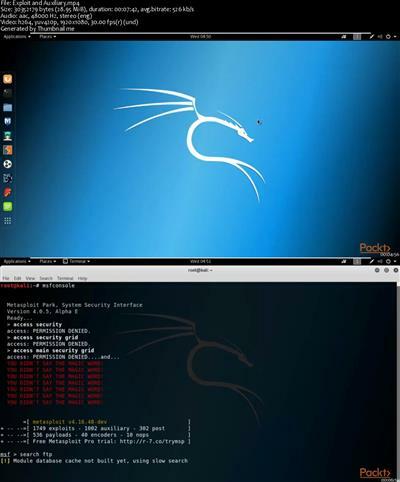 First, you'll explore several supporting tools on Kali Linux. Next, you'll explore how exploits and payloads work together to gain access to systems. Finally, you'll learn how Metasploit Framework works. By the end of this course, you'll have a better understanding of how to use Metasploit to quickly assess the security posture of systems and networks to reduce the risk of attack.